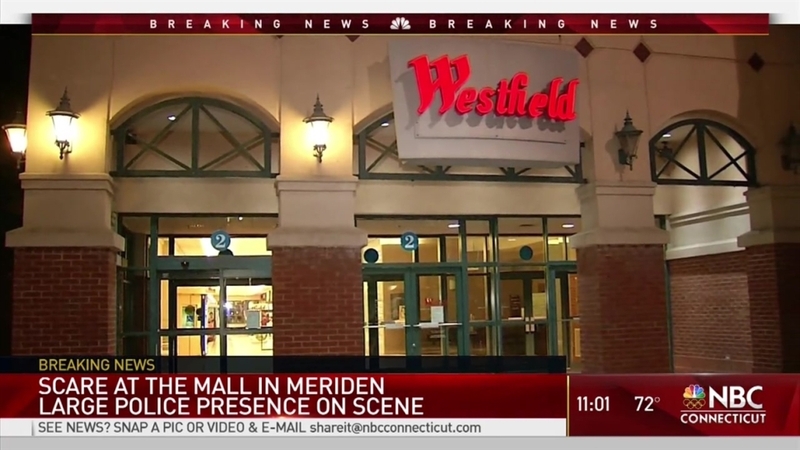 Police rushed to Westfield-Meriden Mall in Meriden on Thursday night after receiving reports that gunshots had been fired and determined there were no shots. While the investigation into just what happened continues, officials said on Thurday night it appeared a transformer in the area went down, causing power to go out and making a noise that might have sounded like a gunshot, police said. It's not yet clear if that led to the panic. As police searched the mall, they found people hiding in bathrooms and dressing rooms, but there was no evidence of a shooting and no one was injured. According to a news release from police, the incident started when a woman told a mall employee that someone was shooting in the mall and police received the 911 call at 8:25 p.m. They have determined that there was no shooter and they are now searching for the person who reported it. Witnesses who were inside the mall described the scary scene. Some employees said SWAT officers responded. Others said the lights went out and people were running for the exits. Mayor Kevin Scarpati praised police for the quick response. "Hats off to Meriden police. We really came together on this one, we acted swiftly to make sure the Meriden community was safe, all the residents inside mall, all the businesses," Scarpati said.